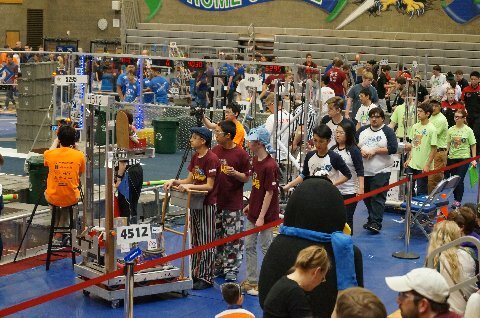 This past weekend the robotics teams from Shoreline School District competed at Glacier Peak High School against 36 other schools. Both Team Pronto and Team ScotBot competed with honor and tenacity showing the STEM skills that had been garnered over the past build season. It was a tough battle and robots did break but were always repaired in time to compete again in another match. ScotBots pillow topped designed scoring robot functioned well and could score point almost at will. Team Pronto hatch installing robot worked well and scored points, also installing hatches, but the students decided to change up strategies three rounds into the event and make the robot into a defensive machine. The defensive strategy paid off. Team Pronto could hold opposing robots from scoring and all around mess with opposing team's plans on scoring. The fast paced defense and quick driving earned Team Pronto the admiration and fear of other teams so much so Team Pronto was asked to be in the final rounds with much higher ranked teams. Team Pronto and its alliance teams battled hard and won the first round of the finals competition but then fell in the second round to the eventual overall competition winners. Many thanks to all the Shoreline people who came to cheer on our students and our teams. This upcoming weekend both teams will be in action again at Auburn High School Saturday and Sunday. Our students look forward to not only competing but to also having a large cheering section so please come see our kids compete. Auburn High School, 711 E Main St, Auburn 98002.